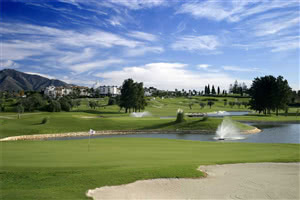 Mijas Golf Club has two 18 hole courses, Los Lagos (The Lakes) and Los Olivos (The Olive Trees). Both courses were designed by Robert Trent Jones in 1976. The club is situated in the valley of Mijas, north of Fuengirola, and only twenty minutes from the Málaga international airport. A particularly popular resort, Mijas Golf Club is one of the businest of all the resorts on the Costa del Sol. The clubhouse is based around an old Andalusian cortijo (farmhouse) although extended and refurbished to provide the quality clubhouse facilities you would expect from a club of this quality. Los Lagos (6367 metre par 71 course with SSS of 74) was the first course to be constructed and offers wide fairways, with numerous lakes -hence its name- and also the many trees which are strategically placed to protect the large greens. Los Olivos (6009 metre par 72 course with SSS of 71) was constructed in 1983-1984, although it has recently been totally refurbished (2000-2001). This course lies in a smaller piece of land, and has different characteristics to Los Lagos. The greens are smaller with undulations and well protected by bunkers. Also, it has a large number of olive trees strategically situated around the fairways, which demand a strong and straight drive from the player. There are two courses at Mijas International, Los Lagos and Los Olivos. In my opinion, Los Olivos wins by a smidgen!